A very busy week around here again! No surprise there. On Monday, the weather was so nice! 60°F! 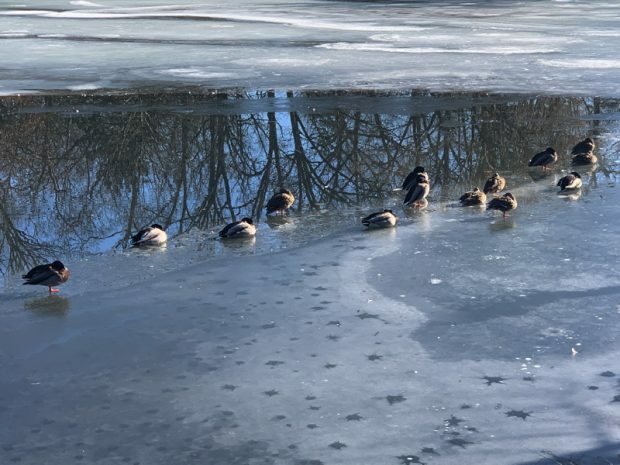 I went out for a nice long walk in the morning and really enjoyed being outside. Then I worked all day on the SFR station website. I mostly worked on the layout of the site and the individual book pages. My eyeballs were ready to fall out by dinner time! I spent the evening on the couch with my Kindle instead of getting back to work. On Tuesday, I worked all day on the SFR Station website again. I did go out for a walk but the rest of the day was spent toiling over code. I worked on installing and developing a content framework for the site and integrating it into the new design and template. I worked on a lot of PHP and even though it was frustrating at times, I got the templates and code to work and do what I wanted it to do. Wednesday was my busy day again. In the morning I caught up on blogs, then off to the chiropractor and acupuncturist. In the afternoon I finished off some back end code to SFR Station while the kids were at tennis. Thursday was pottery day! I spent the entire 2.5 hours trimming all the things I had worked on the last two weeks. I only had about two hours afterward to eat and shower. Then I took the kids to the dentist, and we had dinner and watched the Flash together. Friday continued with the busy life. I worked in the morning before walking on the treadmill. Then I worked until going to Whole Foods. Then I worked until I made dinner. My daughter had an 8-10pm birthday party a 25 minute drive away so I had to take her and a friend to that. Guess what I did after? I worked until she got home. I have a lot of work to do. Saturday, yesterday, I spent the entire day working. I downloaded over 100 covers for the SFR Station website and edited several of the Miso Cozy Mysteries books to take out the honorifics. I ran out of time in the morning to walk, so I walked on the treadmill while working in the afternoon. For the evening, we all had english muffin pizzas and watched Pirates of the Caribbean together. Sunday, today, I plan to continue working. I’ll walk this morning, and then I think I can download the rest of the covers that I need to continue on with the SFR Station website. My awesome assistant, Lola, sent over all the information I need to add the authors into the system, so I’m going to work on that tomorrow. I also hope to finish up my Miso Cozy Mysteries book edits, get them into Vellum, and send them off to my awesome proofreader. 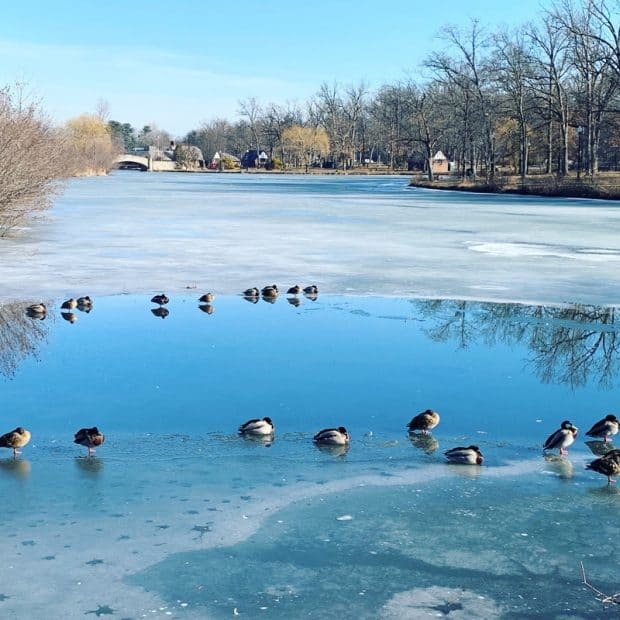 The week started out very warm but the lake was still pretty frozen in the park. Look! 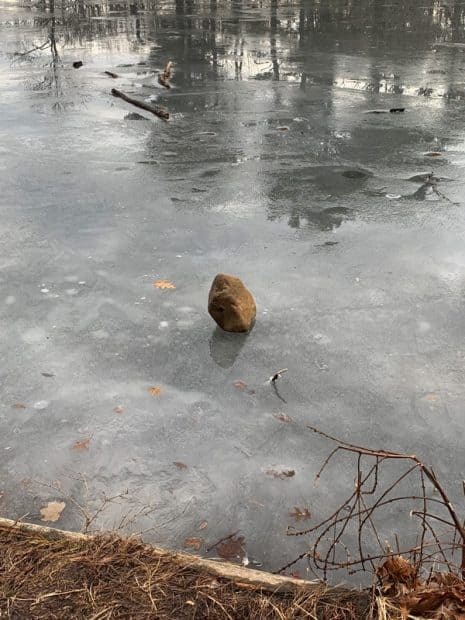 A rock on the ice! 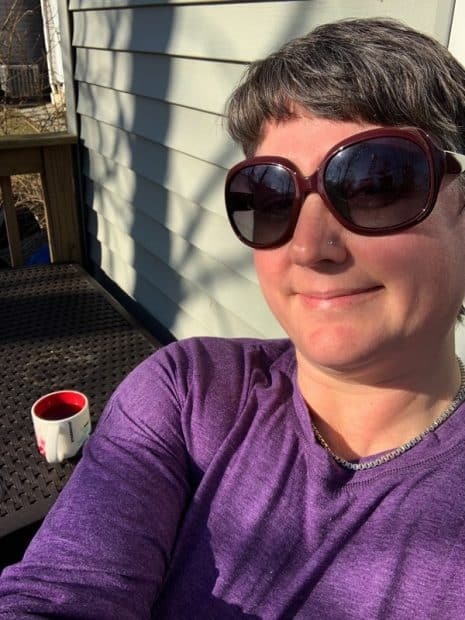 I sat outside and enjoyed my tea in the sun. Our local museum got yarn-bombed. 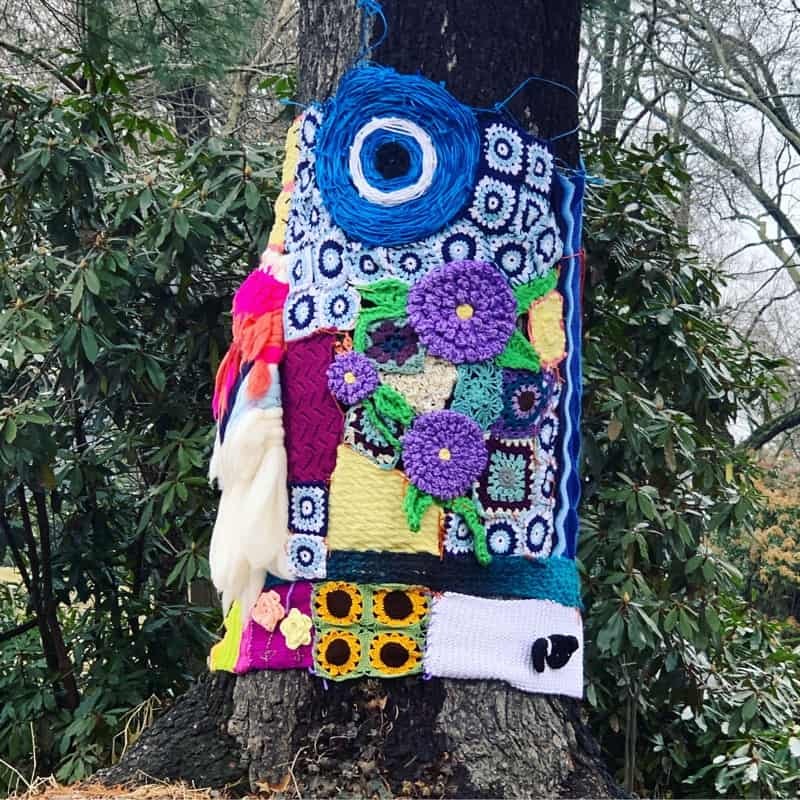 There were several trees covered in yarn creations. 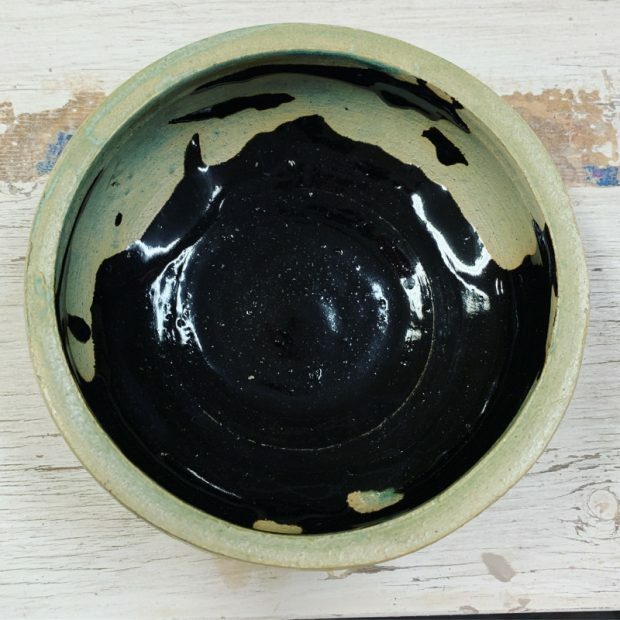 I got back one of my bowls and found out that the two different kinds of glazes I used don’t mix. 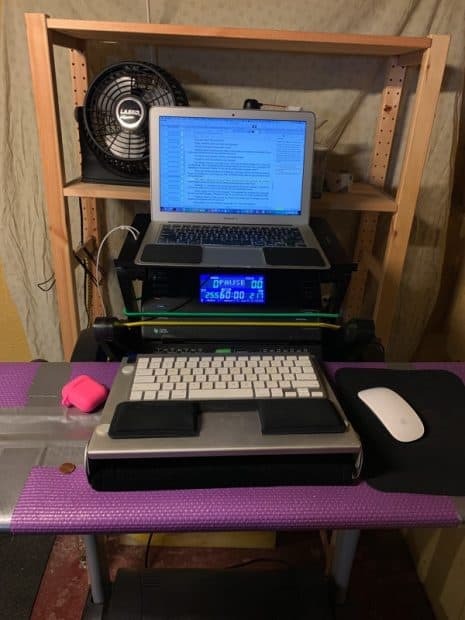 I used the actual desk portion of my treadmill yesterday to get work done. 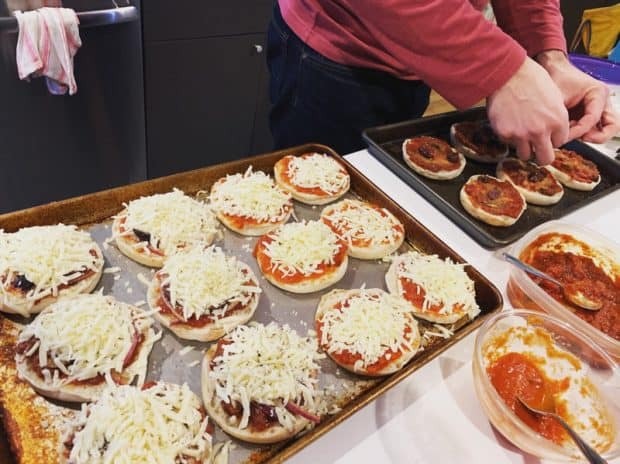 And we all enjoyed English muffin pizzas last night while watching Pirates of the Caribbean.